The blue puzzle piece pin that college basketball coaches and broadcasters have worn on a February weekend each of the past six seasons is a simple gesture to promote awareness for something that is anything but simple. Bringing attention to autism and the impact the diagnosis can have on a child and a family, a group of college basketball coaches are shedding light on the condition. 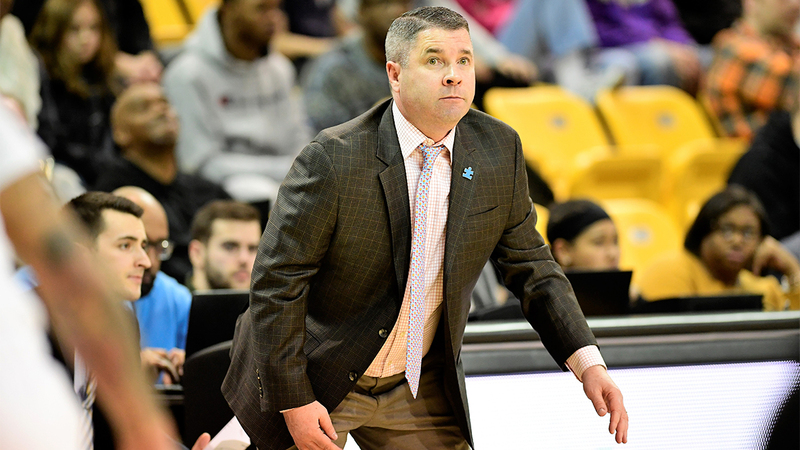 Wearing the pins to promote autism awareness was the idea of University of South Florida assistant coach Tom Herrion and Towson head coach Pat Skerry. The coaches have known each other since their college days in Massachusetts. Herrion attended Merrimack and Skerry went to Tufts. They developed a friendship through summer basketball clinics together and were on the staff at the College of Charleston as assistants in the early 2000s. While basketball has and continues to play a major role in their lives, what bonds these men like nothing else is both have sons on the autism spectrum. Robert Herrion is 13 and Owen Skerry is 10. “We both knew firsthand the impact that a child and the family with a child that has autism can have,” said Herrion. According to Autism Speaks, an organization that sponsors autism awareness, outreach and research efforts, the disorder affects an estimated one in 59 children in the U.S. The coaches thought about doing something to help increase awareness of the developmental disorder that impairs a person’s ability to communicate and interact. The popularity of college basketball with multiple networks televising games, especially on weekends, provided a platform from which to promote their initiative. In 2014, the coaching staffs at Marshall, where Herrion was the head coach, and Towson, where Skerry coaches, contacted the teams that were playing in the approximately 40 nationally televised games on Feb. 1 that year. Herrion and Skerry adopted the blue Autism Speaks puzzle piece pin to help promote the effort, which is known as Autism Speaks Coaches Powering Forward. After supplying pins the first year, Autism Speaks jumped on board the second year to help expand the scope of the awareness campaign. 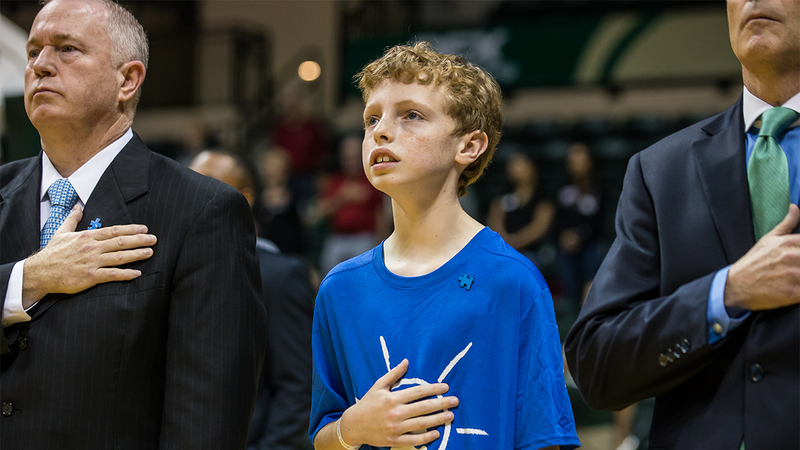 The program has grown into NCAA Autism and Awareness Acceptance Weekend. Nearly 500 coaches participated this year across all NCAA levels on the weekend of Feb. 14-16. 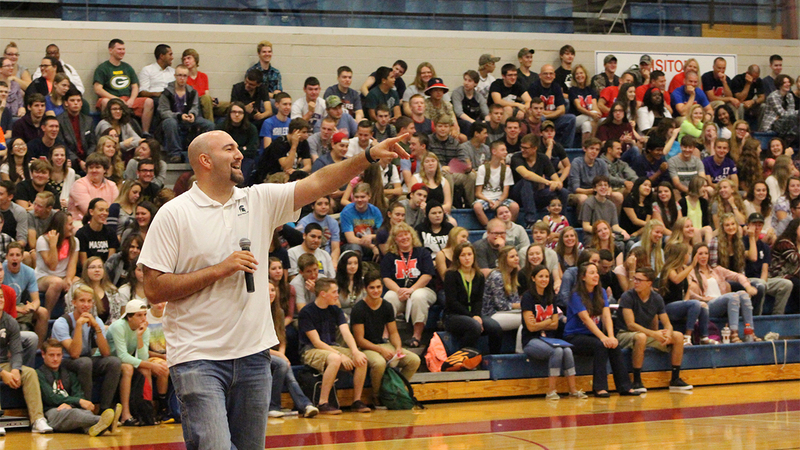 A handful of women’s programs and high schools promoted the initiative as well. “It really started as a true grassroots effort, and I think we have been able to bring some pretty good awareness to the cause,” said Skerry. Anthony Ianni would agree with that. Ianni is one of them. As a 4-year-old, Ianni was diagnosed with pervasive developmental disorder. He is high functioning on the autism spectrum, meaning it can be difficult to detect signs of the disorder. However, among his difficulties is deciphering whether somebody is serious or sarcastic. 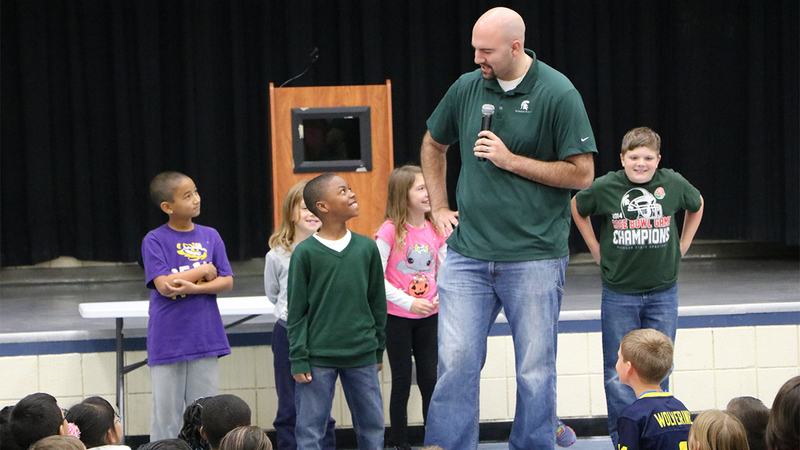 Ianni, who played two seasons at Division II Grand Valley State before transferring to MSU as a walk-on, said that based on his research efforts along with those in the school’s sports information department, they came to the conclusion he was the first college basketball player in NCAA Division I history with autism. While Ianni and Robert Herrion are high-functioning individuals on the spectrum, Owen Skerry and Brandon Matthews have difficulties communicating verbally. That does not mean they cannot have a productive place in society. Indeed, both are very bright. The 20-year-old Matthews is a volunteer manager for the USF men’s basketball team as well as a student at the university. Potential is being realized at Kent State, which this summer will welcome Kalin Bennett on campus. Bennett is, reportedly, the first men’s basketball recruit with autism to sign a national letter of intent with a Division I college basketball program. Making sure others are aware of the potential individuals on the spectrum possess, no matter where on the spectrum they may be, is at the core of what Herrion and Skerry set out to do. Skerry noted autism awareness workshops on the Towson campus attracted 400-500 students. It’s this type of engagement with young adults that is critical because as a group they can not only drive the message, but develop into individuals who can make a hands-on difference combating the disorder. Dr. Karen Berkman could not agree more. Berkman is the executive director for the Center of Autism & Related Disabilities at the University of South Florida. To achieve a better understanding of autism, the center has developed programs with, among other groups, fraternities and sororities to work with autistic individuals. She has met with Herrion to discuss potential autism awareness events that incorporate the men’s basketball program and possibly other student-athletes. The National Association of Basketball Coaches (NABC) has worked with Herrion, Skerry and Autism Speaks in publicizing the initiative and bringing more coaches on board. The NABC and the American Cancer Society teamed in 1993 to found Coaches vs Cancer. In the late ’90s, a Coaches vs Cancer council was formed in an effort to help bolster the message the disease can be fought. Coaches vs Cancer Suits and Sneakers Week this year was Jan. 21-27. Coaches wore sneakers instead of dress shoes to support the cause while encouraging education about early detection, screening, etc. The Coaches Powering Forward campaign has become a pretty nice model itself.